The moment you touch "Phil," you'll know there's more to him than meets the eye. 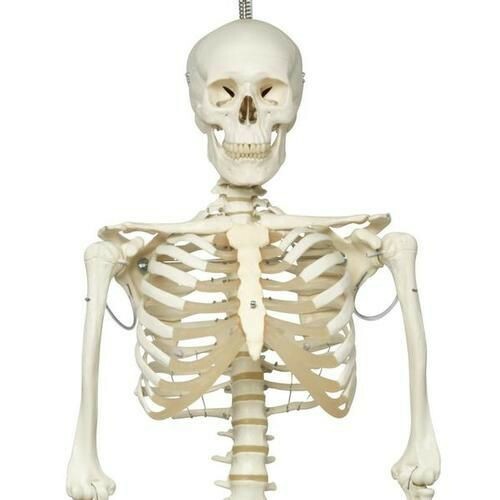 Phil the Physiological Human Skeleton model is painstakingly crafted and hand-painted by 3B Scientific artisans in Germany. Faithful reproductions of the human body's 200+ bones -- which weigh almost the same as real bones -- are assembled on wires to show natural positioning. The entire assembly is then placed on a stable, 6'3" metal hanging stand with five casters. Phil features life-like joints for realistic mobility. This provides internal/external limb rotation and shows how the knee and elbow joints move and stretch. For example, the shoulder blades twist when the arms are raised. Phil's flexible spine mimics natural movements (e.g., lateral bend, stretching and rotation). Even the subtle movements of the sacroiliac joint and the sacrococcygeal symphysis are replicated. All of Phil's limbs are easily removed. Constructed of virtually unbreakable resins, Phil is ready for the rigors of education. He will withstand years of high school and college biology courses and the intense scrutiny of medical students at prestigious universities. He will be a valuable asset for chiropractors, as well as sports and physical therapists -- the visual and tactile aid will help patients understand treatment. The robust fit-and-finish makes Phil ideal for medical engineers during research and design, as well as prototyping. Head-to-toe Accuracy -- Intricate detailing starts with a three-part assembled skull with individually inserted teeth and ends with flexible, movable foot bones. Precision -- Models are painted by specialized artisans using solvent-free paints; final assembly occurs by hand to ensure superior quality and movement. Durability -- Phil's bones are unbreakable; a three-year warranty covers defective materials or workmanship. Well-equipped -- Phil hangs out on a standard metal stand with white casters; a transparent dust cover is included.